Few things scream September and the beginning of the fall season like a visit to the apple orchard. We go every season and buy way more apples than we should. I’m constantly looking for different things to try other than the typical applesauce. Few things are as delicious as these 28 recipes and they range from sugary sweet to gluten free and low carb, so there is sure to be a tempting recipe in this list! These apple recipes are off the hook delicious, tried and true amazing, apple goodness, though. Not a one of them is gross. None of them are difficult, and there are options for everyone. Whether you’re okay with a little bit of sugar and gluten, or you want sugar and gluten free, there is an option (or two, or ten) for you! Let’s embrace the apple goodness and get started with the most amazing apple recipes from around the web. You’re going to want to try every one, I promise. Then, you might want to try them all, again. I won’t judge. Talk about an after school snack win! These are delicious and whip up in moments! Your kids will love them! Easy and delicious without all the work of making crust and baking an apple pie? Um, yes please! Delicious breakfasty goodness topped with brown sugar and cinnamon. You’re not going to have enough to go around. Baked brie? Check. Caramelized apples with just the right amount of spice? Check. Maple syrup? Check. You can’t go wrong with this delish appetizer! Low sugar and gluten free and delicious? This is the perfect treat for just about anyone! What these lack in gluten, they totally make up for in deliciousness. So, so good you’re going to want more! These vegan, soy and nut free muffins will disappear from the breakfast table sooner than you can set them down! Another low-carb, gluten free gem. Who doesn’t love salted caramel? I know I do, and it’s perfect paired with these delicious muffins! This beauty only has 3 ingredients, is vegan, and a cinch to make! Your kids are going to ask you to bake more often. Super easy and reminiscent of a much more difficult to make apple fritter. These are so yummy. Rootbeer has nothing on this delicious twist on ice cream floats. Apple cider and sparkling cider paired up with ice cream and whipped cream? Sign me up. 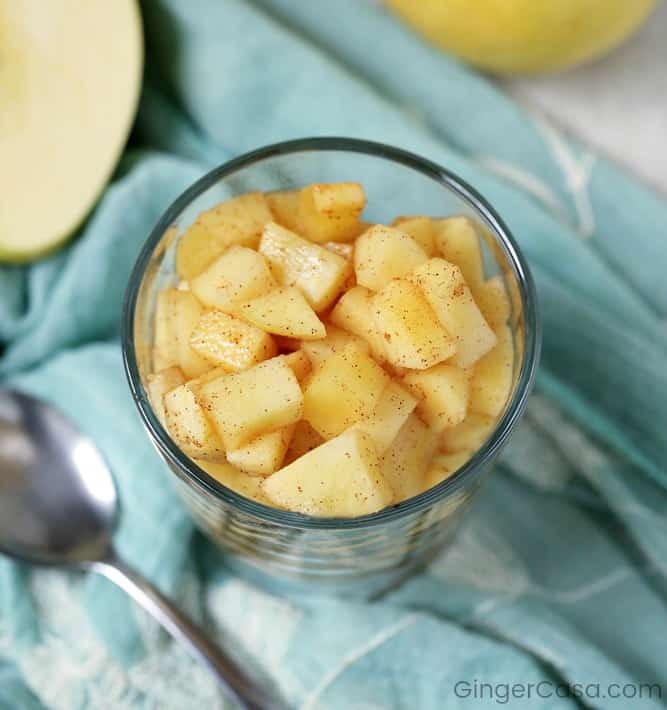 Easy delicious applesauce made in your slow cooker. No need to stand over a hot stove all day! I’m all in. These cuties may end up making an appearance on my Thanksgiving table! So cute, yet so good. Anything made in a slow cooker is a win in my book. This delicious cranberry apple cider has just the right amount of spice to be the best tasting cider you’ve ever had and it’s super easy to make! Caramel and apples just go together like peanut butter and jelly. Amiright? Why not put all of that deliciousness into an easy to eat cookie? Because life needs more cookies. Three of my favorite things put together into a bite sized treat. So, so good and totally worth the effort. An easy after-school snack that you can even make in advance! Apples, peanut butter, and raisins. Yum. So easy to make, yet so good. Perfect for a fall bonfire or after school snack! Anything made in a cast iron skillet is worth sharing, and making. Well, you might not want to share the cake, but you’ll want to share the recipe so they can make their own! 10 minutes to a delicious, healthy breakfast! Who doesn’t want that? Cake, apples, yum. Need I say more? This would be perfect for any fall celebrations, especially Thanksgiving! The perfect combination. Yummy cinnamon rolls with an apple pie kick. I might even add some caramel sauce to these babies, but they’re good as is! These cuties taste just like apple pie without all the hassle and they’re cookies so…. So much better than apple cobbler and less hassle! Apple dumpling taste in cake form. Yes. Super easy, delicious, danish-type treat. Breakfast, or desert? You decide! What a great round up! Love those apple cider caramels! Thanks for including my “naked” apple cake in your round up. Happy fall! Thanks for allowing me to share your cake! Yum :). Happy fall :D.